True Point Audio Ltd's Adjustable Acoustic Isolation Feet are suitable for all Hi-Fi equipment particularly Turntables, CD players and Isolation Platforms. The purpose of using isolation spikes is to decouple acoustic feedback from your speakers or sub-woofer and other sources of extraneous vibration. They are installed to separate your turntable deck, CD player, amplifier or other audio components from vibration. Therefore, the tones will be more focused and tighter. The feet are spiked and fitted with Sorbothane pads which further help isolate your Hi-Fi equipment from unwanted vibration. Our specially designed and precision made Adjustable Isolation Feet will give a much better performance to your Hi-Fi components. The overall height of the assembled foot is 55mm, adjustable to 60mm high. 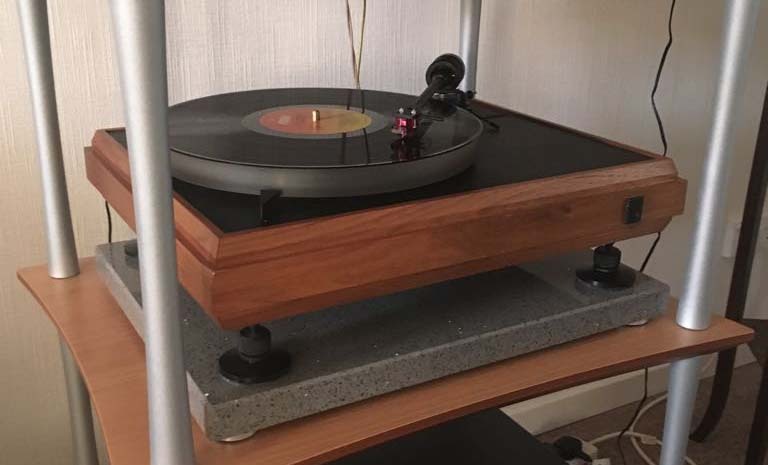 We now offer a new Adjustable Acoustic Isolation Foot which is dimensionally the same as the ones shown in the photo's above, but does not have the pink triangles machined into the base so appears as plain black. By not machining the triangles we have reduced the time taken to produce the foot and as a result of this we can now offer this foot at a much reduced price compared with the original model. Please read the following instructions carefully before fitting the Adjustable Acoustic Feet, we can not accept any liability for any damage caused to the turntable or associated equipment, if you have any queries about fitting the Adjustable Acoustic Feet then please contact us before fitting them. Later on you will need to turn the turntable upside down, but first of all remove the cover of your turntable if fitted. Ensure the the tonearm is secure and its counter weight removed. Ensure the table suspension is secure and the platter is removed, also any other components that may get damaged if not removed or secured when the table is turned upside down. Place the upturned turntable on two blocks either side of the turntable (books can be used if you do not have any blocks). 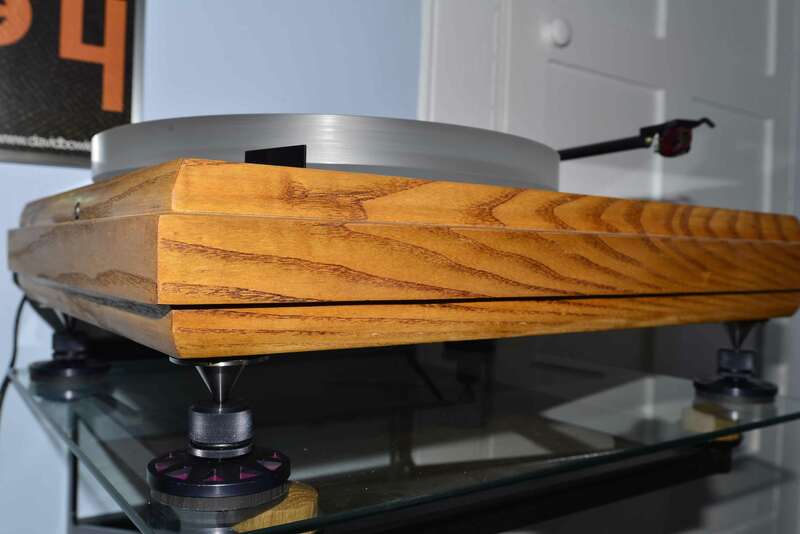 Make sure that the blocks (books) do not scuff the turntable, and are of a sufficient height so that the upturned turntable is clear of the bench surface, and that the tonearm if fitted will not be damaged. Remove original feet if fitted. Check location of where you want the acoustic feet to be fitted, ensure the area is flat and clean. Using a pencil, mark the position with a 40mm diameter circle, you can use the flat part of the stainless steel spike to do this. 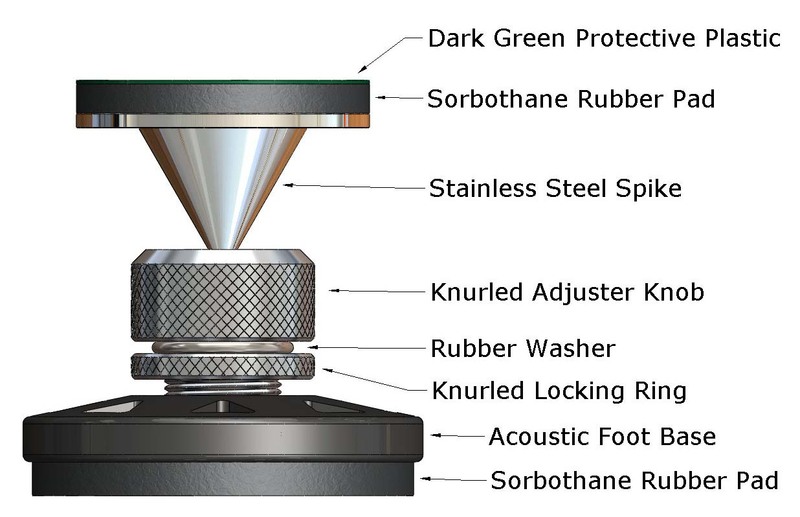 Peel off the thin dark green protective plastic cover on top of the 40mm diameter x 4mm thick Sorbothane® rubber pad fitted to the stainless steel spike. This will expose the adhesive. Carefully place the stainless steel spike in the centre of the 40mm dia' that you have marked, and press it firmly into place. Repeat this operation with the rest of the stainless steel spikes, ensuring that they are all firmly in place. Lift the turntable up and remove the blocks (books), turn the turntable over so that it is the correct side up, slide the acoustic feet under the stainless steel spikes, so that the point of the stainless steel spike sits in the 'V' cup on top of the knurled knob. The base of the acoustic foot is fitted with a 54mm diameter x 5mm thick Sorbothane® rubber pad. Place a 'bull's-eye' spirit level close to the centre of the turntable. 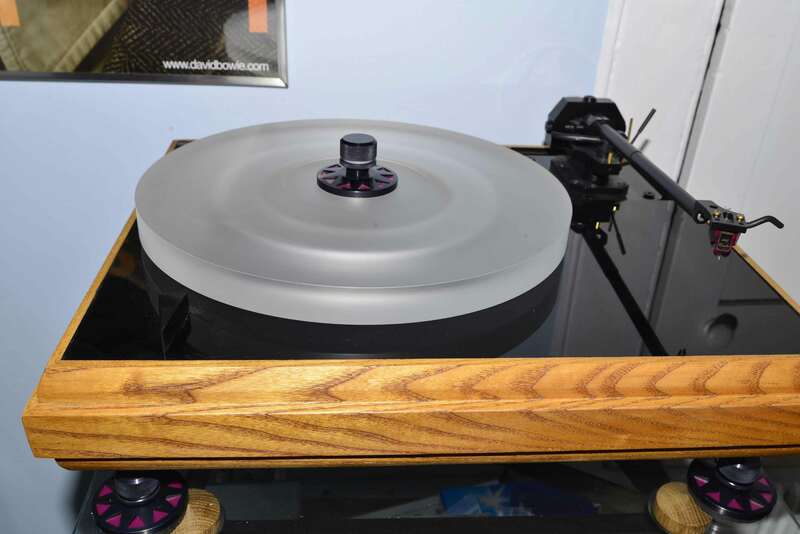 Adjust the knurled knob that is at the corner that the spirit level shows as being lowest, turn the knurled knob anti-clockwise (looking down on top of the foot) to raise that corner of the turntable so that the bubble moves to the centre of the bulls-eye. Repeat this operation with the other corner that is showing as being the lowest. 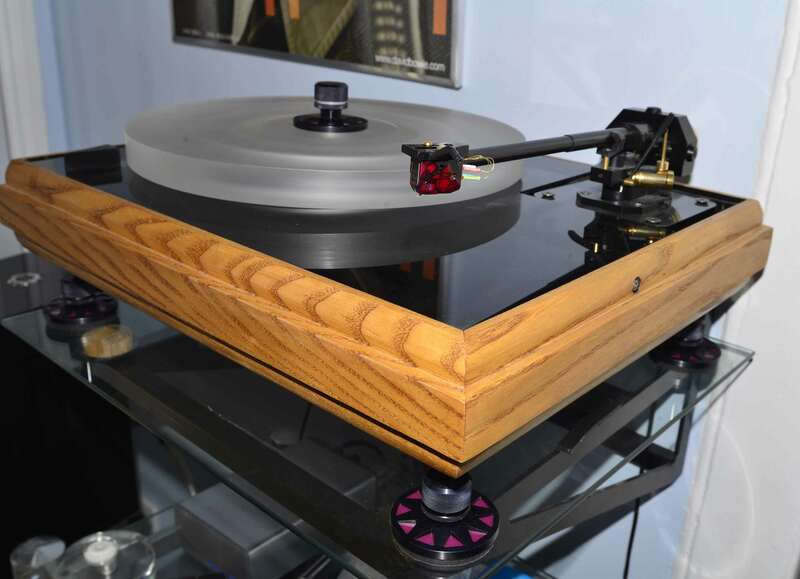 Again repeat this operation until the spirit level shows that the turntable is truly flat. Now turn each of the knurled locking rings anti-clockwise (looking down on top of the foot) until they nip the rubber washer into the knurled nut . The turntable is now level and acoustically isolated. Acoustic Platforms also available to your required size, please ask for details. We reserve the right to change specification without notice. Sorbothane® is registered to Sorbothane Inc, USA.